The basic assortment of Hot Wheels vehicles is hotter than ever! 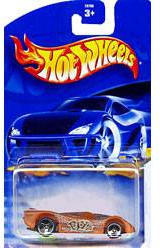 This assortment includes the latest designs and styles of Hot Wheels trademark cars including Backdraft,Nomadder What, and HW Prototype 12 etc. Buy 1 for $2.60Buy 2 / Save $0.14!Buy 3 / Save $0.52! Size (inches): 4.33" X 1.57" X 6.50"
We can not guaranty selection. Some vehicles not for use with some sets.